What comes to mind when you hear the phrase “historic color”? Do you envision a rather limited palette of muted grays, blues, and greens? It turns out you can choose historic paint shades, for use indoors and out, without sacrificing cheerful, vibrant colors. Restoration experts have come to understand that original paint colors in historic homes were probably much stronger than they had realized, but that they had faded over the years. Those pale yellows and grays you’ve thought of as historic probably started out as much brighter shades. If you’re committed to creating an authentic look for your home, look into what colors were common for your home’s style. Georgian-style homes were often yellow or brown. Federal style brought in softer creams, yellows, and wedgwood blue. 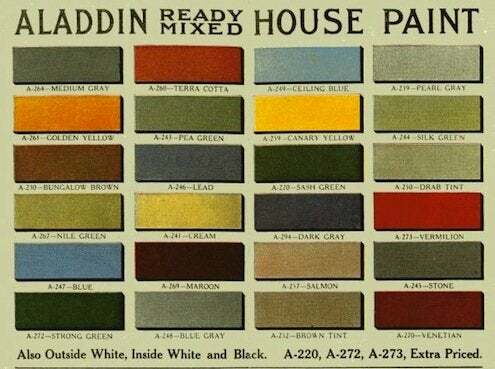 The bright, varied colors of victorian homes had as much to do with new technology as they did with changing styles – as the 20th century approached, chemists were coming up with ways to create a wider variety of colors than had previously been available. They also had at their disposal a brand-new invention that revolutionized the availability of color choices: the paint can!